The Sinhala Buddhist community has a cultural need to depend on a larger than li fe figure to continuously save them and cleanse the country, which is why the people voted for the Mahinda Rajapaksa faction instead of the coalition partners of the current government, according to a leading economist. “There is a trait in the particularly hierarchical Sinhala Buddhist society of yearning for the Big Man, coming to cleanse the country of all its ills, to take charge of wayward children and take us forward to a golden future,” said the Finance Ministry Senior Advisor and the state-run Institute of Policy Studies Chairman Professor Razeen Sally. He said that the Rajapaksas are particularly talented at playing to those emotions; the habits of the heart of the Sinhala Buddhist culture. “Some politicians, you know who I mean, in your party are not necessarily the right people to lead the country,” Prof. Sally told the Young Professionals’ Organization of the United National Party (UNP) delivering a lecture last week. Prof. Sally said that the hopes for reforms and the betterment of ordinary people simply has not materialized under the current government, and while the gilded, chattering classes in Colombo are unaffected and think there’s no chance of a Rajapaksa revival, the rural Sinhala Buddhists are now disappointed, and have revived their habits of the heart. “There’s no investment, jobs or growth. 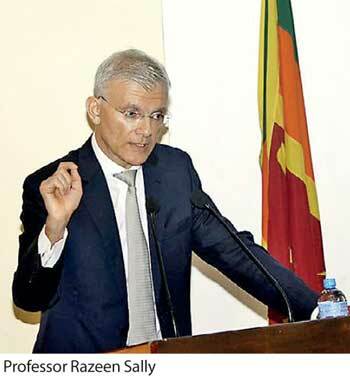 They view this government as dysfunctional and incompetent, while the Rajapaksas won a war, brought peace and developed infrastructure,” Prof. Sally said. He said that this is despite the current Central Bank Governor and Finance Minister putting the right policies in place over the past year, which gave the country a glimpse of a possible take-off scenario of reaching sustained 8 percent growth in the future if the right productivity and free market reforms are enacted. “An 8 percent per annum growth rate would deliver returns that would spread beyond those buying apartments in Altair, the Colombo City Centre, the Port City which is to come and Shangri la and so on,” he said. Stagnation however matters little to the Colombo elite, he said. “That matters little to the chattering classes, the gilded classes, but it matters to the classes who are deprived of the things that others of us have. They will be condemned to a future of under educated, under skilled, underpaid, under developed life,” he said. However, he said that the Sinhala Buddhists, who consume Sinhala media, are not educated on the need for the reform agenda, since Sinhala media does not talk about the costs of protectionism and the advantages of free trade, and the UNP isn’t attempting to counter the narrative effectively through these channels. “Policies with effective communication; that requires talent and expertise, and the UNP is very bad at doing that,” he said, noting that Rajapaksa has his finger on the pulse of the people, while some in the UNP, like Sajith Premadasa, too does. Many in Sri Lanka’s streets argue that the country can only be controlled and given direction by a strong leader with despotic tendencies like Rajapaksa. Prof. Sally said that this is because people were afraid of abductions by death squads, and did what the Rajapaksas wanted without questioning.“So this Sinhala Buddhist Big Man will come in and clean the house, incentivize patronage politics, gut institutions of independence, and Sri Lanka will be back to a Vladmir Putin style, Caesarean illiberal democracy,” he said. He added that Rajapaksa would place the country further in debt with China to pursue populist policies in an environment which leaves no room to slacken fiscal and monetary policies, making Sri Lanka a Chinese vassal state. Further, Rajapaksa appeasing the Sinhala Buddhists, and his policies which would put a strain on the economy, would also exacerbate racial tensions, similar to how economic downturns had a hand in stoking racial tensions before the civil war, Prof. Sally said. He added that if better ground level incentives are offered through reforms and cleaner institutions, which create jobs via local and foreign investments, the people would see the possibilities available to them by following a different narrative. “That behaviour would change, not necessarily from tonight to tomorrow morning, but over time. The reality is that we may have a long wish list, but we need to prioritize,” he added, noting that the government has to win small victories with small reforms in order to stay in power to bring in the big reforms. Why is it necessary for a foreign economist to say this. I thought most Sri Lankans knew it. We are becoming so poor we may need to learn to eat grass like the North Koreans. People don't understand government debt. It is the direct link to consumer prices. They are confused, it is said government is in debt, but like a bank which demands for loan money, no one demands payment.